Because of the size of most chickens, unless you’re having a major dinner party, it’s not very often that the Accidental Locavore gets to taste-test poultry head-to-head, but I wanted to try a recipe from Persiana with Cornish game hens, and when my local store had two different brands, it seemed like the perfect time to see if Bell and Evans was significantly better than Perdue. And when I say significantly, at Adams where I bought the birds, there was a $2/pound price difference between the two. Straight out of the package (both in shrink-wrapped plastic), there was a big difference. As you can see from the photo, the Perdue bird was bright yellow and the Bell & Evans a blue-pink. The Perdue hen had a tiny packet of giblets (which would make it a clear winner to the dog, who was the happy recipient) and it was a bit bigger. Both of them were marinated together and cooked together. I cut the wing tips off of the Perdue bird, in case they were difficult to distinguish after cooking, but that turned out to be unnecessary as it retained its sunny yellow color even after roasting. When we were eating them, they were referred to as pink bird and yellow bird, since I didn’t want Frank to be influenced by knowing which was which. It was an easy recipe with good results – both birds were delicious, moist and tender. There really wasn’t any difference in taste, which could have been because the marinade I used had a strong “flavor profile.” Possibly, if they were simply roasted or grilled you might have been able to taste a difference, but it would have been subtle. Where there was a noticeable difference was in the tenderness and texture of the meat. 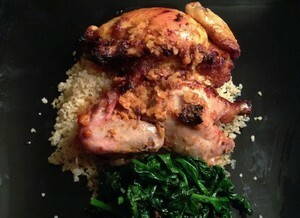 Surprisingly, the Perdue hen was more tender and the texture of the white meat was better. 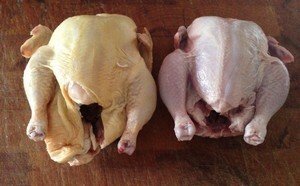 The texture of the Bell & Evans bird was a little gummy and not as tender as the “yellow” bird. I’m not sure why that was, and quite honestly, I pretty much assumed that the Bell & Evans bird would be far superior (and not just because of the additional cost). So now, I guess we’ll have to wait until spring, invite a bunch of people over, toss some chickens on the rotisserie and see how chickens compare.